(Sp) This Magnetic Train set is a nice way to introduce kids to building with magnetic tiles. If you already have magnetic tiles this 30 piece train set will make an excellent addition. The train tracks can be combined with many other wooden sets as well. Use it to promote imaginative play, motor skills, and attention. This wooden Scoop & Serve Ice Cream Counter is super cute and realistic. Use it to encourage pretend play, social skills, and communication. This Mini Band set comes with ukulele, tambourine, clapper, rattle and rainmaker. Use it to encourage a love for music while exploring different instruments. These Wooden Dough Tools would make a fun addition to dough, clay or sand play. Using them also promotes creativity, coordination, and motor skills. Three Little Piggies is a 1 player strategy game that requires visual perception, attention, and problem-solving to complete. An adult can help introduce and set up the game then encourage a child to solve the puzzles independently. This beautiful Deluxe Railway set comes with road and rail tracks, stations, bridges, cargo cranes, a container ship, a truck, a bus, play figures and more. Playing with this encourages imagination, fine motor skills, and attention. Castle Logix is a 1 player strategy game that requires the use of visual perception, attention, and problem-solving to play. See if a child can replicate the picture designs using the blocks provided. The challenges increase in levels of difficulty as you go. Corolle dolls are created by French designers to spark imaginations and encourage pretend play. The doll’s face, arms and legs are made of vanilla-scented, soft-touch vinyl and have a soft body that can move easily and sit up “all on its own." 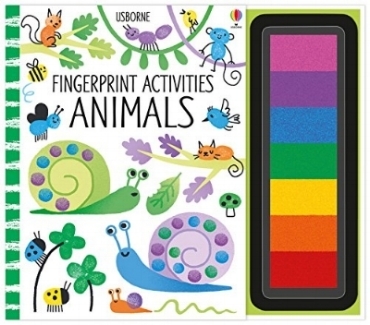 Create different animal pictures by using your fingers! Besides being super fun and engaging, Fingerprint Activities promotes finger isolation, creativity, and fine motor skills. This Musical Mat is not only an exciting gift idea,but also a great way to get kids up and moving. It helps children learn rhythm and musical patterns as well. There is no better and more useful toy than a wooden block set. This one comes with 60 natural finished blocks to promote hands-on, imaginative play, motor skills, visual spatial abilities, and attention. This craft kit comes with everything kids need to create 4 unique collages. Engaging in craft activities promotes creativity, fine motor skills, attention, and coordination.